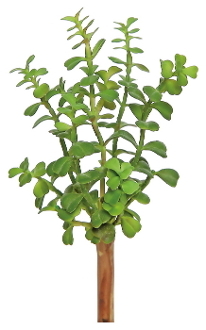 Jade Tree Permanent Botanical For Miniature Fairy Gardens. Scaled perfectly for gardens, it will add color for indoor or outdoor design. Flexible branches and nice full size to create shade for your fairies. You can manipulate these branches to create a super realistic look - and the leaves are awesome in feel. 8" Tall. No Need to Water!